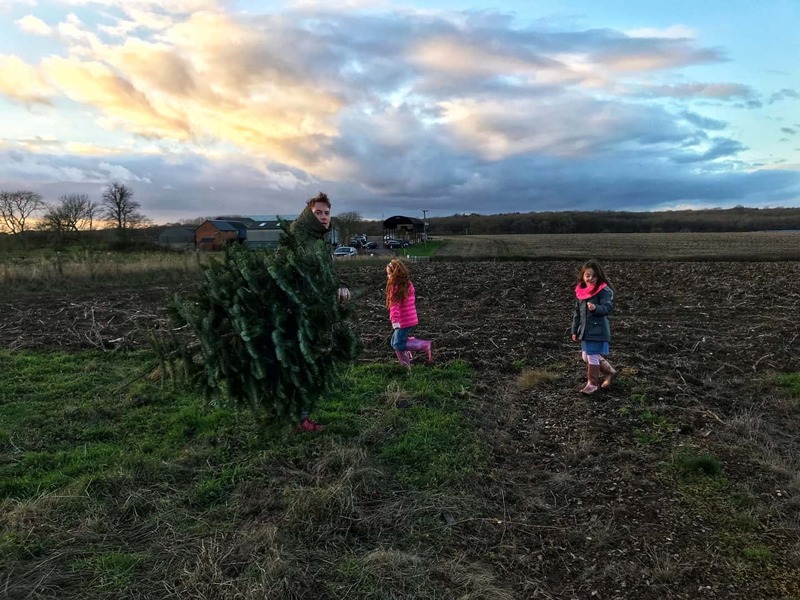 Do you like to get a real Christmas tree, or do you reuse a faux one? I am firmly in the real Christmas tree camp. 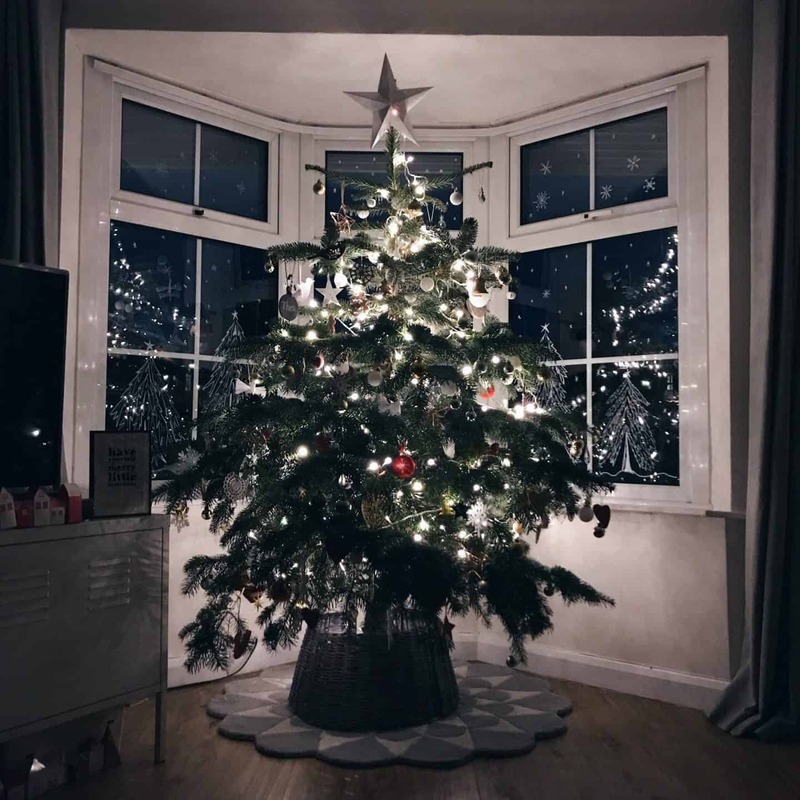 No matter how realistic a fake tree looks, you just can’t beat that Christmas tree smell. 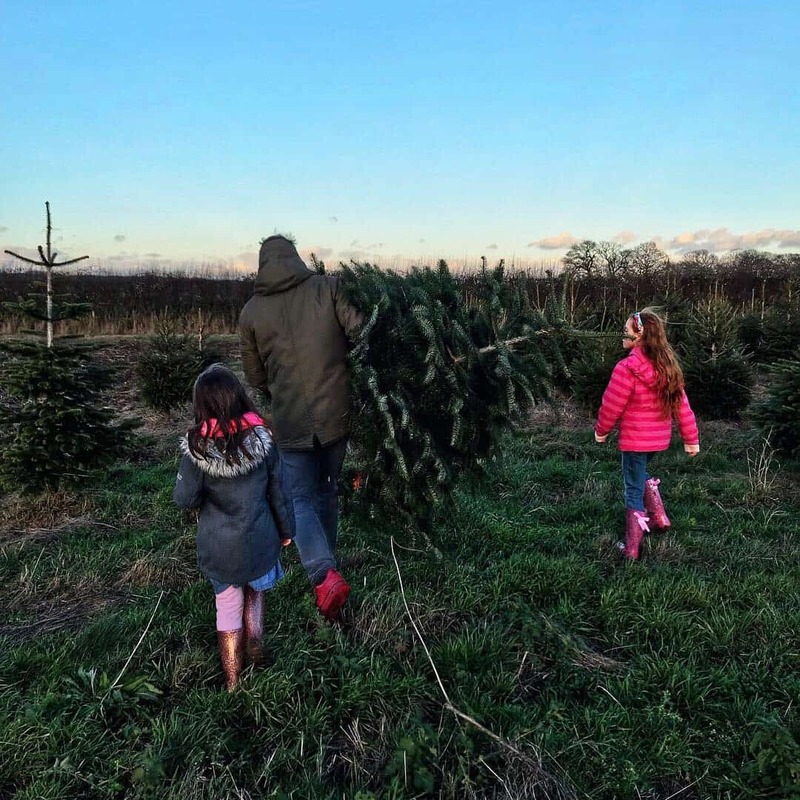 This year, we went to Stoke Goldington Christmas Trees to pick our own perfect Christmas tree, fresh from the field. 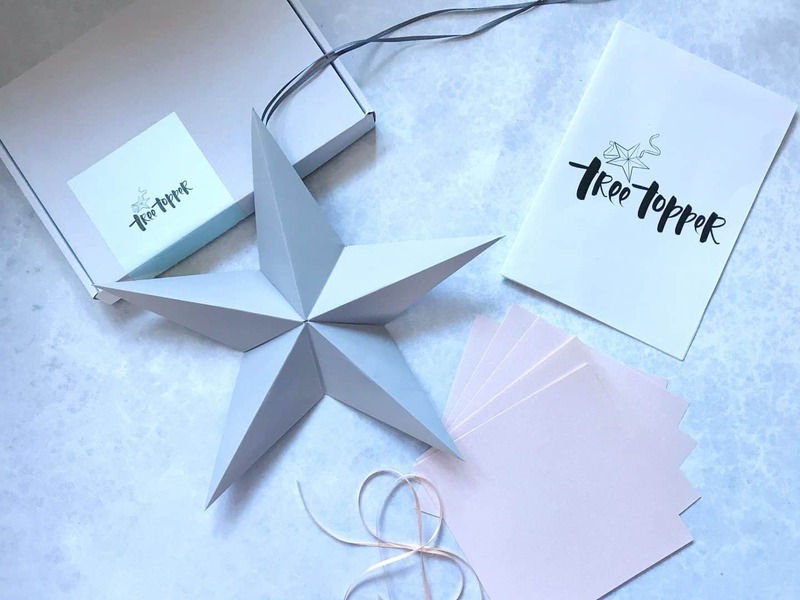 It was such fun, and so festive I thought I’d share the experience with you. 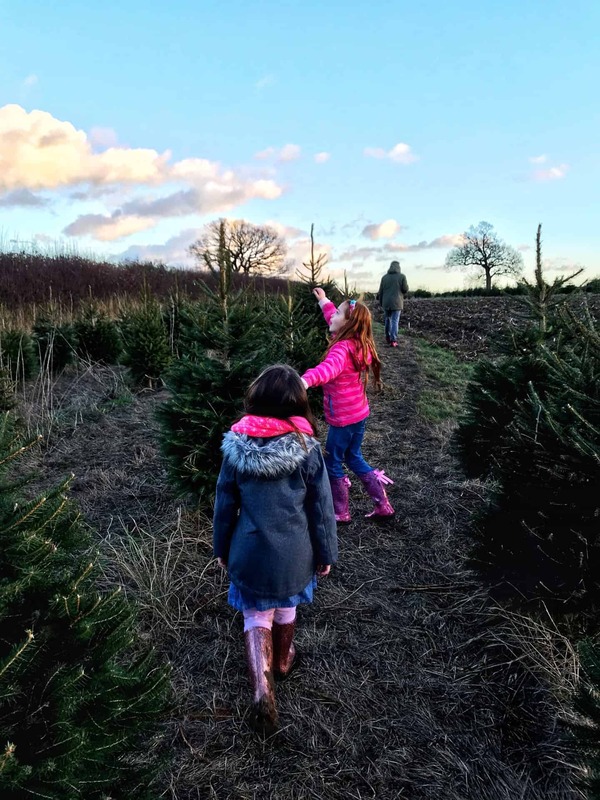 Stoke Goldington Christmas Trees is in between Milton Keynes and Northampton, and they have fields of Christmas trees to choose from. They charge by the metre, and direct you to the right area of the farm for the height you need. They also give the grown ups some mulled wine, which really helps you get into the Christmas spirit! They will be closing down for the season today, but hopefully you’ll remember this for next year if you’re in the Milton Keynes area! Then, we found it. The perfect height and bushiness for the Pink family. We had a quick look at the rest of the field just in case there was an even better one. But there wasn’t so went back to find this beauty. 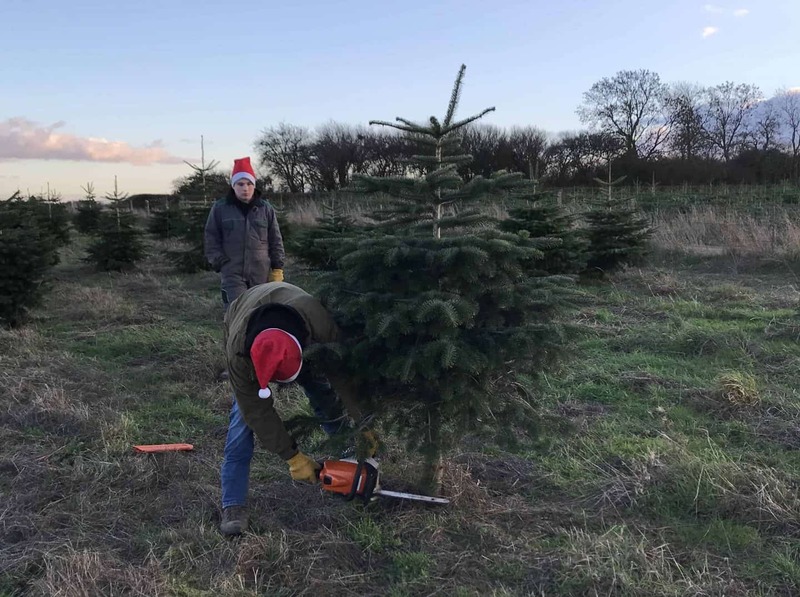 One of the guys who works at the farm came over and chopped it down for us. Then we just had to carry our tree to the car parking area to get it put in a net, and to pay. The people who work there will help if you need it, but Ryan decided to carry our tree himself. 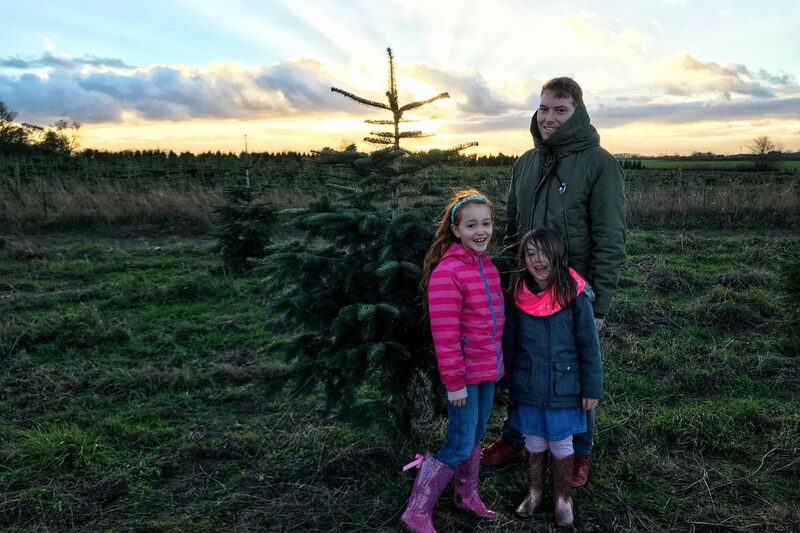 Our Christmas tree is around 6 foot tall, and cost £45. I think that’s reasonable as it’s a Nordman Fur and is fresh from the field. 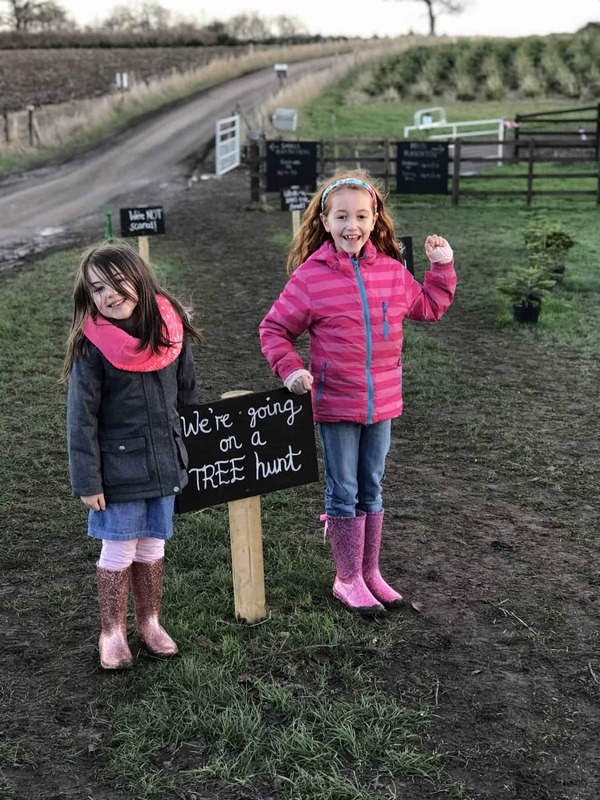 I’m also happy to be supporting a local farm, and we really enjoyed the experience! They are only open on weekends so if you’re thinking of visiting, check their website first to make sure they are open. 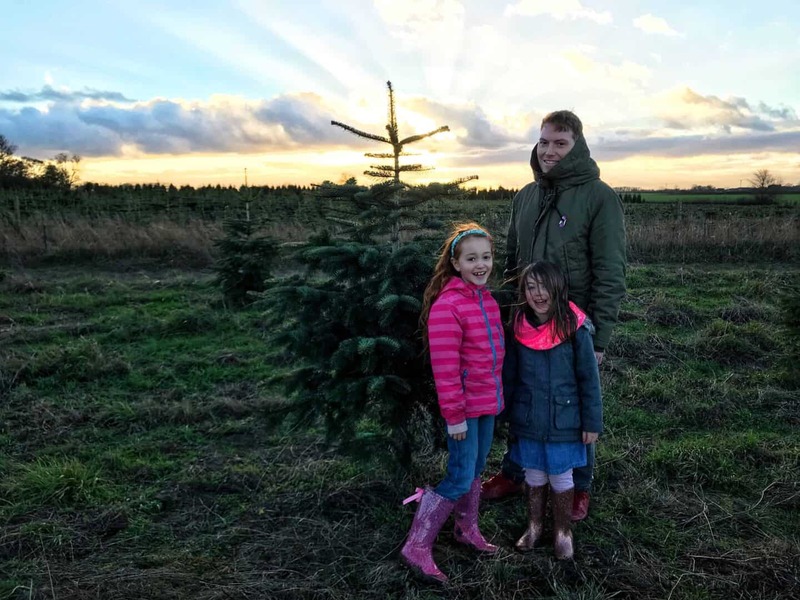 As you can see, we had lovely bright weather when we went to get our tree. We decorated it that evening. We always use the same decorations each year, perhaps adding one or two new ones to replace the ones that inevitably break. You can see a time lapse video I took of us decorating it here! 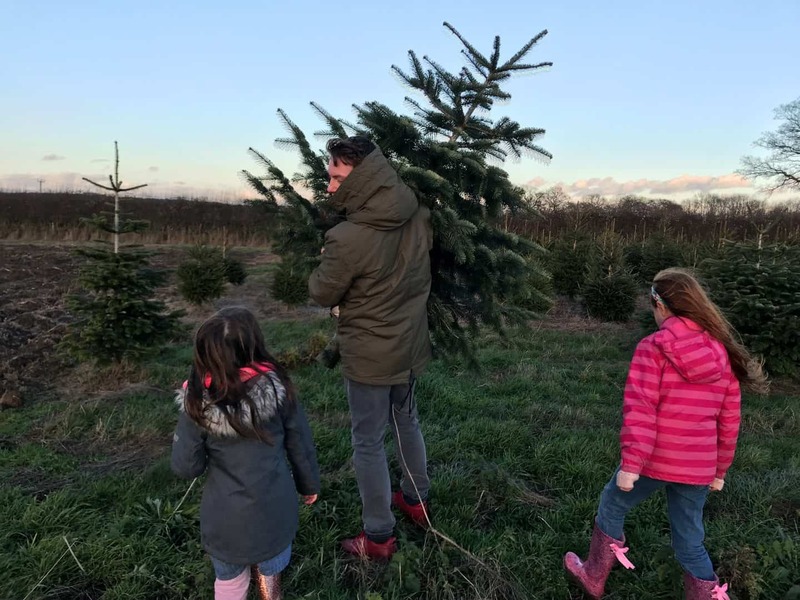 I think we will get our Christmas tree from Stoke Goldington Christmas Trees next year too, it was such a fun experience! 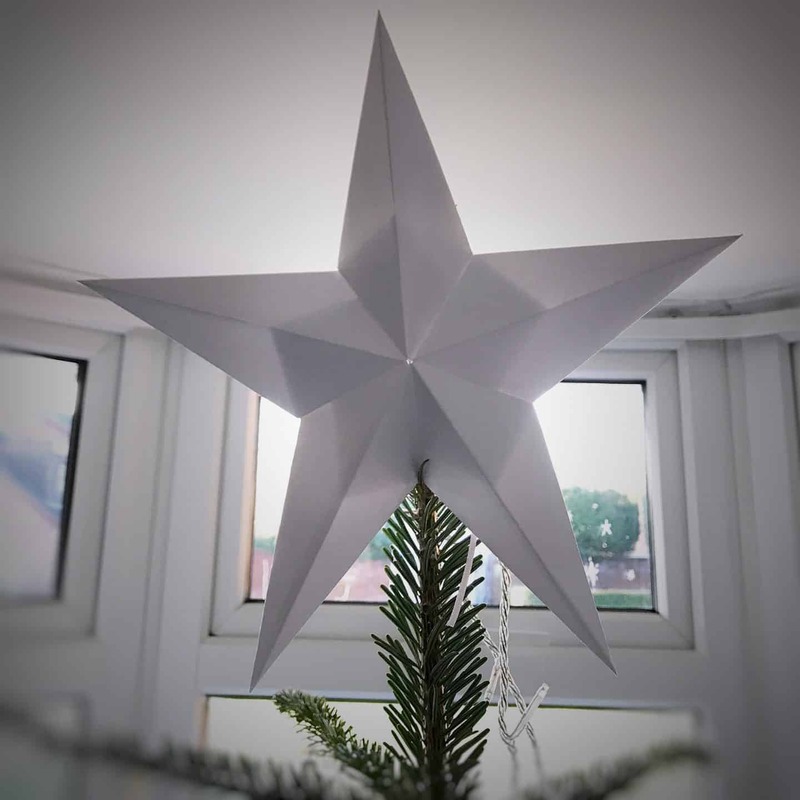 I made the paper origami star from a Christmas Tree Topper Kit I bought from OrigamiEst – it comes with enough papers to make three, I chose white, grey and pale pink. I think they will become general house decorations, rather than Christmas decs though, as I love them! They were such fun to make too. 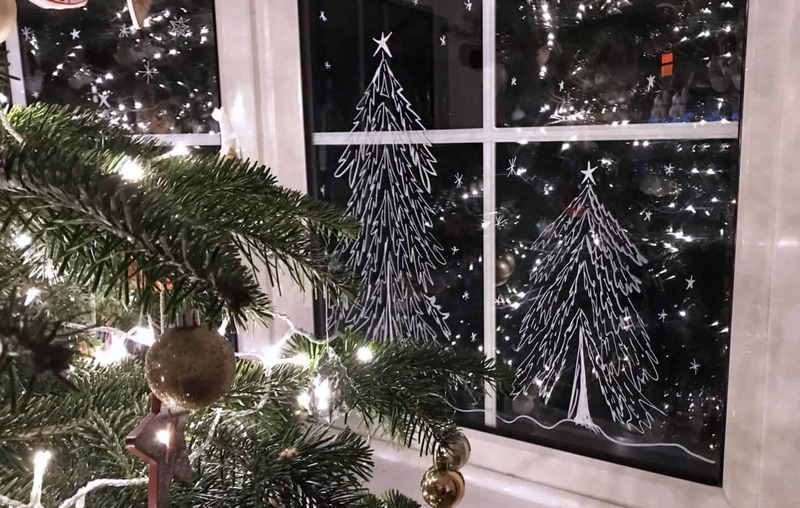 If you want to know how to decorate your windows with chalk paint pens, you can read all about it here.